When you save and close a drawing, AutoCAD remembers the last displayed view and opens it to that view. That’s convenient for continuing where you left off. But what if other people are also working on the drawing and they change the display? Or if you know you want to go to another part of the drawing? Display the view that you want to be able to display. Choose View > Named Views (in AutoCAD Classic workspace) or View tab> Viewports panel> Named (in 2D Drafting & Annotation workspace in AutoCAD 2009) . Name your view and click OK twice to return to your drawing. Save and exit your drawing. Click Open to display the Select File dialog box. Check the Select Initial View check box, as you see here. 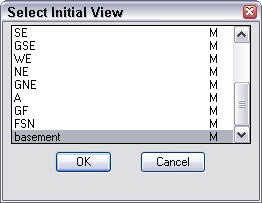 In the Select Initial View dialog box, choose your view and click OK.
I’m sure I once found a way to open AutoCAD and a drawing straight to a named view by creating a shortcut to the drawing (not to AutoCAD) and adding a command parameter to go to the view I wanted – but I can’t remember how I did it. Does anyone know? Andrew, yes, you use the /v command-line switch. I explain it at https://allaboutcad.com/create-a-shortcut-to-a-template-and-workspace/. where ‘DAs’ is a known working view. It opens in the last saved window. I am running AutoCAD LT 2012 and Windows 7 32bit. I’m sure I’ve used this in the past on an earlier version of AutoCAD LT.
I’ve now found it works if I add “drive:pathname\acadlt.exe” first, but this will only work on first opening, as subsequent ones open a new copy of AutoCAD every time, so it doesn’t seem to work from a drawing shortcut.